The Anka Sings Sinatra tour will honor a great artist who has influenced Paul Anka more than anyone else throughout his career, Frank Sinatra. It will also feature the hits that have spanned Paul Anka’s amazing career in celebration of his 60th anniversary. It will be a night to remember as Anka Sings Sinatra: His Songs, My Songs, My Way! Born July 30, 1941, in Ottawa, Canada, into a close-knit family, Paul Anka didn’t waste time getting his life in music started. By 13, he had his own vocal group, the Bobbysoxers, and by 15 he became a star with his first number one hit, “Diana”. After a few hit songs, Anka, confident in his talent as a writer, wisely knew that being a songwriter meant the power was in the pen. As a result, he went on to write for Connie Francis, Leslie Gore, and Buddy Holly. In the early 60’s, he became a junior associate of Sinatra and the Rat Pack. 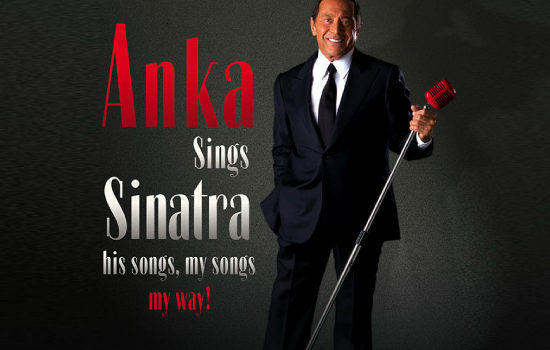 In the late 60’s, Anka wrote “My Way” for Frank Sinatra and by the 70’s, he had another string of hits like “(You’re) Having My Baby”, “Don’t Like To Sleep Alone”, and “Times Of Your Life” which confirmed his status as an icon of popular music. If this wasn’t enough, it was revealed upon its release in 2009, that Anka co-wrote Michael Jackson’s posthumous #1 worldwide hit, “This Is It,” which has further cemented his place upon the most prolific and versatile songwriters of any generation. In April 2013, his new 14-song album entitled Duets was released by Sony Music Entertainment and featured artists such as Frank Sinatra, Michael Jackson, Tom Jones, Celine Dion, and Michael Bublé. Duets set a milestone in Billboard Chart history because with the CD, Anka became the only artist to have a CD on the Billboard Top 100 Chart for seven consecutive decades. To date, Paul Anka has over 90 million sales worldwide and his songs have been performed over 100 million times. You won’t want to miss this show in the Cowlitz Ballroom on Thursday, October 11th at 8:00PM! Tickets for the show go on sale July 13th at 10:00AM and range from $39 to $59 each.